We talk often about concealed carry everywhere else, but at home. Many of us have families, children, which begs the question of “Should I carry at home?” Well, let’s look at it from this point of view: where are the most important people with you for the most amount of time? Typical answer is: at home. So, out of all the places you go, why wouldn’t you want to carry in that place? 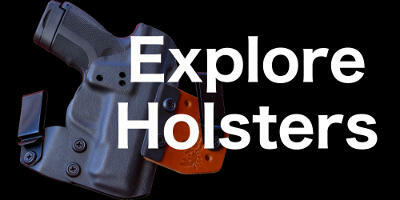 Many of you have misgivings about carrying around your children, some ask “what if I’m playing with my kids and my gun falls out on the floor?” Well, if you’re gun ends up on the floor while you’re rolling around playing with your kids, then you need to reevaluate your holster options. The most secure place from your kids are in a safe (which I understand is an only option for some of you) or on your person. Now, this isn’t what I want to focus on. If you want to know more about home carry options, visit many of our other posts, like Home Defense or Where to Keep Your Gun at Home. But I want to talk about two of the most vulnerable times—sleeping and showering. Go ahead and get the laughing out because, yes, we’re talking about concealed carry in the shower. Or simply in the bathroom. Nowadays, I keep a machete in the bathroom—because I’m worried about what water might do to my firearms. So why not the modern equivalent to a sword? Other, less eccentric, individuals keep a pistol in a water-tight container in various locations (some suction-cupped to the wall of the actual shower). Are there any of the other options that I haven’t included? Let me know in the comments!